Making readers care and feel like they’re part of the story should be the number one goal for all writers. Ironically, many storytellers fail to maximize one of fiction’s most powerful elements to achieve this: the setting. Not only can the right location become a conduit for emotion, it can also provide conflict, characterize the story’s cast, reveal significant backstory Making readers care and feel like they’re part of the story should be the number one goal for all writers. Ironically, many storytellers fail to maximize one of fiction’s most powerful elements to achieve this: the setting. Not only can the right location become a conduit for emotion, it can also provide conflict, characterize the story’s cast, reveal significant backstory, and trigger the reader’s own emotional memories through sensory details and deep point of view. To ask other readers questions about The Urban Setting Thesaurus, please sign up. One of the main things I'm working on in the third draft of my novel is giving it a better sense of setting. SO NATURALLY THIS BOOK WAS SUPER HELPFUL. I haven't used it a whole lot yet, but I can't wait to! The only downside is that it IS a secular book, so there's a handful of sketchy locations listed. (casino, nightclub, liquor store, etc) I don't plan on ever using those pages since my characters will never be in those locations. XD Also one of the examples in the beginning pages has a few sw One of the main things I'm working on in the third draft of my novel is giving it a better sense of setting. SO NATURALLY THIS BOOK WAS SUPER HELPFUL. I haven't used it a whole lot yet, but I can't wait to! The only downside is that it IS a secular book, so there's a handful of sketchy locations listed. (casino, nightclub, liquor store, etc) I don't plan on ever using those pages since my characters will never be in those locations. XD Also one of the examples in the beginning pages has a few swear words. Bleh. The Urban Setting Thesaurus starts with a discussion of how to use setting to assist with characterisation and back story. This leads into a section on how to use the sensory details of the setting to draw the reader into the story. I agree with the writers that the use of setting in this way is often overlooked, with plot and characters usually being the key considerations. This section of the book has a lot of good advice on letting the setting do some work for you, and how to integrate releva The Urban Setting Thesaurus starts with a discussion of how to use setting to assist with characterisation and back story. This leads into a section on how to use the sensory details of the setting to draw the reader into the story. I agree with the writers that the use of setting in this way is often overlooked, with plot and characters usually being the key considerations. This section of the book has a lot of good advice on letting the setting do some work for you, and how to integrate relevant aspects of the setting into the action. The main body of the work is a thesaurus of specific urban locations. These are split into categories: In the city (locations such as the bank, the courtroom, and a hotel room, Restaurants (such as coffeehouse, diner, and fast food restaurant), Retail stores (such as flower store and pet store), and Entertainment venues (such as art studio and museum). Each specific setting has a list of many sensory details, split by the five main senses. Following this is a list of possible sources of conflict in the setting, people commonly found in the setting, some tips on the setting, and a brief written example. I think this book will be a very useful addition to my collection of writing tools. The discussion on using the sensory details of the setting to enhance the characterisation already has me thinking about how I can improve my writing. The wide variety of settings included in the book mean have covered most of the settings I can think of. It's very comprehensive. My only caveats would be that the urban settings are predominantly contemporary, and some have an American slant. So if you are writing a contemporary novel in another country, you may need to adapt the setting. For example, sporting event stands in the book are focused on American sports, whereas, if I, a Brit, were writing about a sports stand, I would be more likely to refer to football scarves than pom-poms. If you are writing a historical novel, you may find only the basics helpful, as many of the settings would not be appropriate. I'm writing fantasy, and in that respect, it will depend on the tech level and type of your fantasy setting as to whether you will be able to make use of it. I have an urban setting in my current work in progress, but I would, for example, have to substitute my magical glow globes for fluorescent lighting. If you write contemporary urban fantasy, however, the book would suit with minor tweaking. I'm so glad I got this handy little book! The introductory material about settings and their purpose is full of great reminders. But the best part is the actual thesaurus part, where you can look up almost any imaginable urban setting and read a detailed list of likely sights, sounds, smells, tastes, and textures & sensations. In addition, the authors include suggestions for possible sources of conflict in that location, people commonly found there, related settings that may tie in with it ( I'm so glad I got this handy little book! The introductory material about settings and their purpose is full of great reminders. But the best part is the actual thesaurus part, where you can look up almost any imaginable urban setting and read a detailed list of likely sights, sounds, smells, tastes, and textures & sensations. In addition, the authors include suggestions for possible sources of conflict in that location, people commonly found there, related settings that may tie in with it (with links to the entries about them in this book - YES! ), and notes and tips with additional information. There are even examples of brief, well-written scenes that could take place in each of those settings, utilizing sensory details and various literary techniques. After each entry, there's a convenient link to return to the table of contents. Creating compelling, believable settings is one of the most overlooked yet vital components of storytelling. Too little can make your story feel flat; too much can overwhelm and frustrate readers—either can potentially pull them out of the story or cause them to stop turning pages altogether. As with the other books in the series*, The Urban Setting Thesaurus offers a comprehensive, but easy to understand format and when you open the book, you quickly see that a great deal of thought has gone into the layout, which starts with a common misconception about setting and moves into other discussions, including using setting as a vehicle for characterization and backstory, where to implement setting, utilizing sensory details, pros/cons of choosing real world settings and common setting snags. I recommend reading these sections before proceeding to the thesaurus entries, as they serve as a fantastic springboard for getting you into the setting mindset. In the city—construction sites, elevators, fitness centers, parking garages/lots, waiting rooms, etc. Restaurants—coffeehouses (a writer’s favorite), diners, delis, pubs, etc. Retail stores—bookstores, convenience stores, shopping malls, pawn shops, etc. Sports, Entertainment & Art Venues—art galleries, bowling alleys, movie theaters, museums, etc. If these weren’t enough to get your creative juices flowing, the thesaurus entries are followed by a couple of cool resources: an Emotional Value Tool and a Setting Checklist. 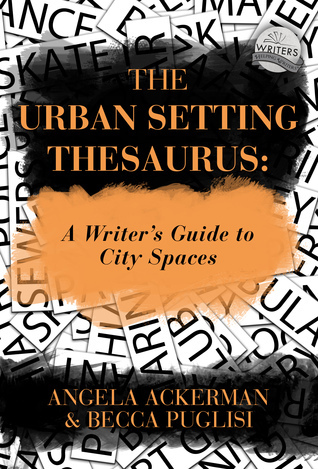 The Urban Setting Thesaurus is another fantastic addition to the Thesaurus collection—which are the only writing craft books I have in BOTH print and .pdf versions. Having said that, if you are looking for books that will enhance and improve your writing—whether you are a student, a newbie writer or a seasoned pro—these books are a must have. Eh, kind of a boring opening, right? So any good author worth his or her salt would want a really impactful way to describe the setting, one that will draw readers into the story and keep them there. Authors want readers to feel as if they’re living the story through the point of view character’s eyes, so their experience with the book will not only be worth their time and money, but will keep them coming back for more. This is where The Urban Setting Thesaurus: A Writer’s Guide to City Spaces will come in handy. The authors, Angela Ackerman and Becca Puglisi (sheer geniuses, if you ask me!) have written a book that will help authors describe and weave in setting descriptions so effortlessly that readers will not want to skim any part of the book. While this book covers settings one would find in urban areas, it covers so much more about the craft of writing. As I read this book, I found myself highlighting important tidbits on nearly every page. The authors discuss the importance of weaving setting in to stories to portray emotions, give hints of backstory, sensory details, etc. When it comes to the description for each setting, it’s so much more than just “here’s what a construction site looks like”. Each setting lists: sights, sounds, smells, tastes, textures and sensations, possible sources of conflict, people commonly found here, related settings that may tie in, setting notes and tips, a setting description example, then techniques and devices used, and resulting effects. We’ve got a veritable goldmine of information in this book! It’s one thing for an author to imagine a setting, or to have possibly visited a particular setting, and this book has so much more than just lists of the five senses your character might experience in a specific location. I’ve been a fan of these authors for several years now, and have all of their previous thesauri, as well as belong to their “One Stop for Writers” website. This new book puts them on a whole new level. So do yourself a favor and get this book immediately to take your writing to a new level. I’m going online right now to order the companion book, The Rural Setting Thesaurus: A Writer’s Guide to Personal and Natural Places. I received this book from the authors in exchange for an honest review. Very handy if you're waffling between certain types of settings for your scenes. Probably the most handy part is the inclusion of different senses that could be included, to avoid just vision through an entire novel. Bringing in other senses is sometimes hard and easily forgotten, so this book can help remind an author of what to add to their prose if they feel it's falling a little flat or feeling a little empty. A lot of generic locations, but a few more unusual ones. Though it's made to be a starter and get your own creative juices flowing, I felt it was biased and too short for the price. It didn't live up to the expectations of The Emotional Thesaurus. It still does what it was intended for which is to jump start the creative process so for that I give it a three star review. Ackerman and Puglisi have published an entire series of books designed to help authors create unique details. Some focus on character building, others on world building. The Urban and Rural Setting Thesauruses focus on the latter. The main part of these books is the actual thesaurus, which lists places an author is likely to write about. Under each listing, they have included descriptive details you are likely to find in each location arranged by sense: sights, sounds, smells, tastes, textures an Ackerman and Puglisi have published an entire series of books designed to help authors create unique details. Some focus on character building, others on world building. The Urban and Rural Setting Thesauruses focus on the latter. The main part of these books is the actual thesaurus, which lists places an author is likely to write about. Under each listing, they have included descriptive details you are likely to find in each location arranged by sense: sights, sounds, smells, tastes, textures and sensations. They also list people commonly found in that environment and possible sources of conflict, as well as a written example of the setting. Obviously, the lists can't be exhaustive, but they are an excellent jumping off point for authors. It's hugely useful to get a full-sensory description of a place your character goes when it's not a location you personally frequent, and these details can prove the difference between a flat setting and a vivid one. The first section of each of these books also contains about 30 pages of useful, engaging articles designed to help authors use their setting descriptions to the fullest. The Rural Setting Thesaurus includes: "Crafting Settings That Create Emotional Connections," The Setting as a Vehicle for Establishing Mood," The Setting as a Vehicle for Conflict," "The Setting as a Vehicle for Steering the Story," "Figurative Language: The Key to Enhancing Your Setting", "Common Setting Snags," and "Rural Setting Considerations." In the Urban Setting Thesaurus, you will find: "The Giant Misconception: Who Cares About the Setting?" "The Setting as a Vehicle for Characterization," "Setting Matters: The Importance of Where," "The Setting as a Vehicle for Delivering Backstory," "The Crown Jewel of Settings: Sensory Details," "Urban World Building" The Pros and Cons of Choosing a Real-Life Location," "Common Setting Snags," and "Other Urban Setting Considerations." As you can see, the authors split the articles so they didn't overlap, so if you want the full spectrum of information you'll need to get both books. Comic book artists used to use something called a "morgue." It sounds a bit macabre, but the morgue was really nothing more than an alphabetized collection of images of various locations, to which a cartoonist could refer when drawing a scene, in order to give it some verisimilitude. Say, for instance, you wanted to place your character in a bowling alley or in a dentist's office, and you wanted to get the details of those two environments right (we've all been to bowling alleys or dentists' off Comic book artists used to use something called a "morgue." It sounds a bit macabre, but the morgue was really nothing more than an alphabetized collection of images of various locations, to which a cartoonist could refer when drawing a scene, in order to give it some verisimilitude. Say, for instance, you wanted to place your character in a bowling alley or in a dentist's office, and you wanted to get the details of those two environments right (we've all been to bowling alleys or dentists' offices, but chances are we probably weren't taking notes while there). You would merely dig into your morgue and look under the B's and D's to reacquaint yourself with the locales in question. "The Urban Setting Thesaurus," is basically a Cliff's Notes morgue for writers, who want to get the bare-bones vibe, ambiance, or description of various locales when writing fiction. The quality of the descriptions on offer inside varies, and the authors too often leave out the exteriors/structures of the places that they're describing. This is a pretty egregious oversight, because stories and novels usually have the literary equivalent of cinema's "establishing shot," whereby an exterior is described (along with maybe the weather) before getting to the action going on inside the building. The book also provides sensory details for each entry, but makes another pretty big mistake under the heading of "Taste" by being a bit too literal and forgetting that some smells are strong enough (or malodorous enough) that they (sometimes unfortunately) can also be considered tastes. How many war stories or criminal procedurals have you read, for instance, in which a character describes the smell of blood or bodies so strong that it could be tasted? Unpleasant, sure, but a large part of what drives multiple genres of fiction is unpleasant, and taking this into account would have made the book better. I received a free copy of Angela Ackerman and Becca Puglisi’s The Urban Settings Thesaurus: A Writer’s Guide to City Spaces in exchange for an honest review. Since I'm a fan of their Emotion Thesaurus, I was excited to dive in. The Urban Setting Thesaurus is a wonderful resource for a fiction writer! The bulk of this book and its sister craft book, The Rural Settings Thesaurus, is comprised of two-page entries describing dozens of settings that could pop up in any fiction genre — from a police c I received a free copy of Angela Ackerman and Becca Puglisi’s The Urban Settings Thesaurus: A Writer’s Guide to City Spaces in exchange for an honest review. Since I'm a fan of their Emotion Thesaurus, I was excited to dive in. The Urban Setting Thesaurus is a wonderful resource for a fiction writer! The bulk of this book and its sister craft book, The Rural Settings Thesaurus, is comprised of two-page entries describing dozens of settings that could pop up in any fiction genre — from a police car to an emergency room, the stands of a sporting event to an art gallery. Each entry provides a wealth of sensory words describing the sights, sounds, smells, textures, and even tastes that characterize that setting. In the recording studio entry, you find sights like vocalists warming up, cords running from instruments to outlets and recording equipment, and the “recording” light to let you know to keep quiet. You hear humming or instruments being played, smell takeout Chinese food or coffee, and feel the snug fit of headphones over your ears. If your scene takes place in a setting you’ve never been to, this thesaurus can help you craft the experience your characters will encounter in a way that will make your story feel more real to your reader. Not sure where a scene should take place? A flip through entries listed in the table of contents could help you brainstorm. Perhaps your protagonist is mulling over whether to confront her antagonist…she could do that anywhere. But what she sees, hears and touches as she weighs her decision could more vividly show her mood and emotions. What backdrop would carry the most emotional impact? Would highlight her fears and the challenges she’ll need to face? In addition to the setting entries, there is a wealth of information in the first chapters of The Urban Setting Thesaurus on how to use setting to convey your story with the most impact. These chapters discuss how to use setting to create a mood, to characterize a room full of primary and secondary characters, and to heighten tension. They also illustrate using all the senses to pull the reader into your scene. The Urban Setting Thesaurus opens with some great suggestions on how to use setting to make your story come alive and then an entries for various settings and what they might be like. They include the sounds, smells, tastes, sensations and possible sources of conflict that might come from that setting amongst other suggestions. Again, an invaluable resource. I have the whole set on my kindle which I can carry with me for easy reference. On the Kindle version the table of contents is linked and y The Urban Setting Thesaurus opens with some great suggestions on how to use setting to make your story come alive and then an entries for various settings and what they might be like. They include the sounds, smells, tastes, sensations and possible sources of conflict that might come from that setting amongst other suggestions. Again, an invaluable resource. I love all the books these two authors published thus far. With me being a country girl of meager means, this book was very helpful for writing a book with part of the setting being urban. I don't have the $ to travel to all the places I may want to write about. This book helps me create places similar to the places I would like to go. I also like Ackerman and Puglisi's blog and website. There is so much helpful information that writers can obtain from these two ladies. I love this series of books. They're great desk references for authors wanting inspiration for their writing. It helps spur new ideas and helps your writing from becoming stagnant and repetitive (just like having a regular thesaurus does for your word choice). I would highly recommend these books for anyone looking to improve their craft. Great for writing descriptions of urban areas. Such a useful book series! I keep coming back to it time and time again. This book always remains close by as I work on my own fiction titles. HIGHLY RECOMMENDED. The Emotion Thesaurus is the most used by me out of the series and this is a CLOSE second. MUST HAVE. All I can say is that these sets of Thesauruses is a must for any author of fiction. It's a tool I can't live without! Angela is also the co-foun ANGELA ACKERMAN is a writing coach, international speaker, and co-author of 7 bestselling books for writers, including The Emotion Thesaurus: A Writer’s Guide to Character Expression (now an expanded 2nd Edition). Her books are available in six languages, are sourced by US universities, and are used by novelists, screenwriters, editors, and psychologists around the world.